Meet the First Ever, Black Heather. We’re so excited to announce the launch of our new Black Heather fabric! When we analyzed the assortment of heathers in the competitive landscape, we realized something big was missing. A black heather simply did not exist. We came across various shades of dark grey but there was nothing close to a true black heather. The concept of combining our best-selling color (black) with our fastest-growing fabrication (heather) seems fairly obvious, but the execution proved to be extremely difficult. After 18 months of research and development, we fused a top-selling color (black) with our fastest-growing fabrication (heather), to create the first-ever black heather fabric. Launching something so groundbreaking took an extremely talented technical team and a whole lot of trial and error (aka many late nights at the BELLA+CANVAS HQ). But once we landed on this shade, we knew we nailed it. To us, it was important that the fabric was a true black, but that it also featured the texture of a heather blend that our customers (aka you!) know and love. According to Co-Founder Danny Harris, “Every year, we ask ourselves, how can we push the envelope in terms of innovation and, as we often find, sometimes the best ideas are the simplest. 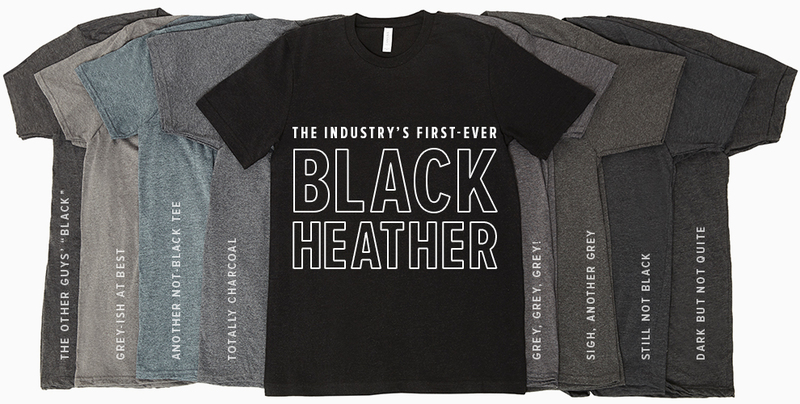 We looked at the competitive landscape and realized no one had a black heather. I don’t know if the industry lacks innovation or the concept proved to some too difficult to execute. But either way, after 18 months of being told it can’t be done, we nailed the perfect true black heather.” In other words, this collection is so good, it’ll win you that customer you’ve always wanted. Today we launched Black Heather in our best-selling 3001 Unisex Jersey Crew. We’re set to release a total of 16 styles in 3 fabrications including Heather CVC, Triblend, and Flowy Poly-Viscose. We’ll also be launching a new video each week so remember to check out bellacanvas.com each week! At BELLA+CANVAS, we strive to BE DIFFERENT. We embrace the challenge of bringing retail-quality tees to the wholesale space, and are so excited to, once again, bring something new to you. Want to see the Black Heather collection in person? Click here to get a free sample!